Renowned science broadcaster Jay Ingram headlines the Atlantic launch of The Science Media Centre of Canada (SMCC). 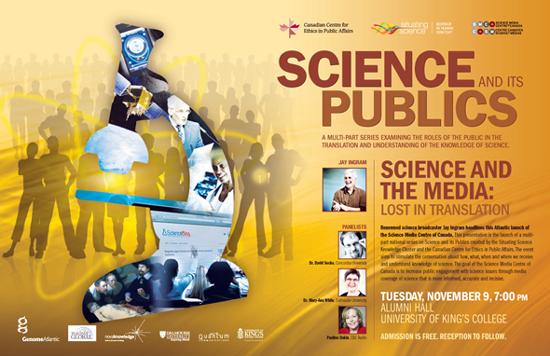 Ingram, who is a member of the Order of Canada for his lifetime service and contribution to the communication of science, will be joined by a panel of experts in a discussion about the translation of science in the public sphere. The event aims to stimulate the conversation about how, what, when and where we receive and understand knowledge of science. This presentation is also the launch of a multi-part national series on Science and its Publics created by the Situating Science Knowledge Cluster, (www.situsci.ca) and the Canadian Centre for Ethics in Public Affairs, (www.ccepa.ca). The Science Media Centre of Canada is an independent, not-for-profit organization that exists to raise the level of public discourse on science in Canada by helping journalists access the experts and evidence-based research they need to cover science in the news. (www.sciencemediacentre.ca). Free admission with a reception to follow. This event is supported by the generosity of Genome Atlantic; Halifax Global Inc.; novaknowledge; Quantum Communications; Dalhousie University; and the School of Journalism, University of King's College.